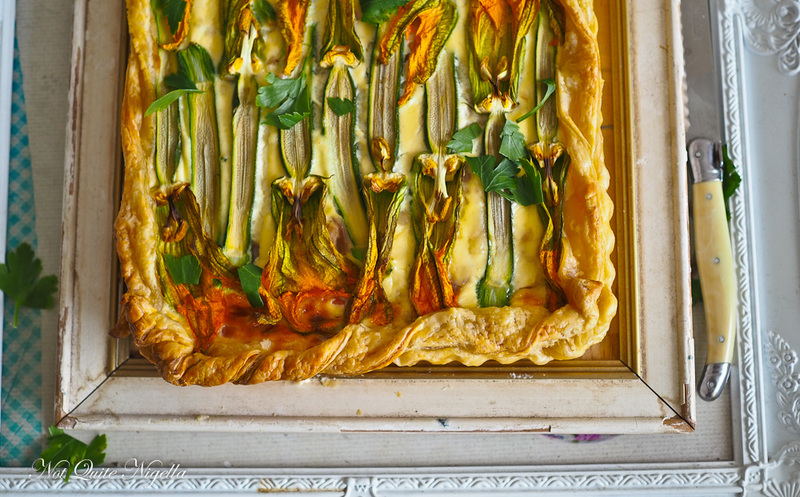 Florabundance - A Zucchini Flower Tart! 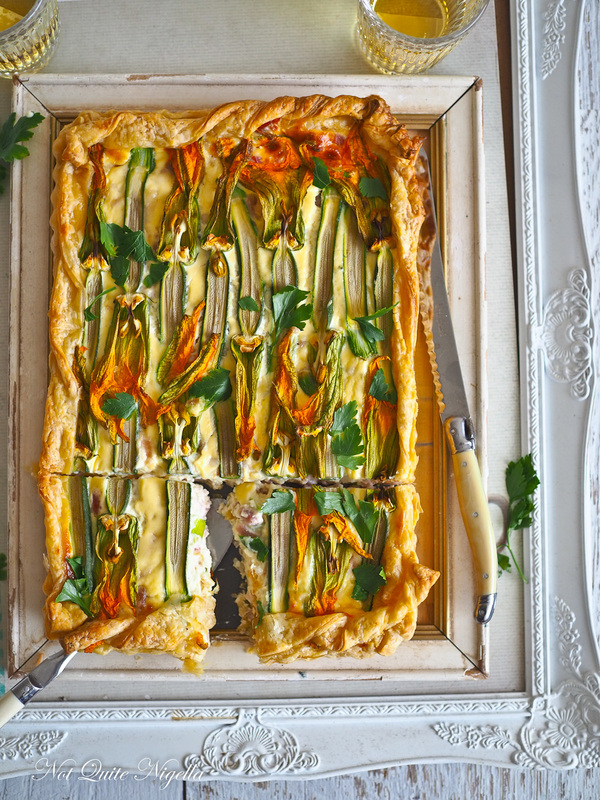 This sublime ricotta tart with zucchini flowers is something else. I am so excited to share this recipe with you because quite honestly, I thought that it might be too plain, with too few ingredients and that the tart would suffer because of it. 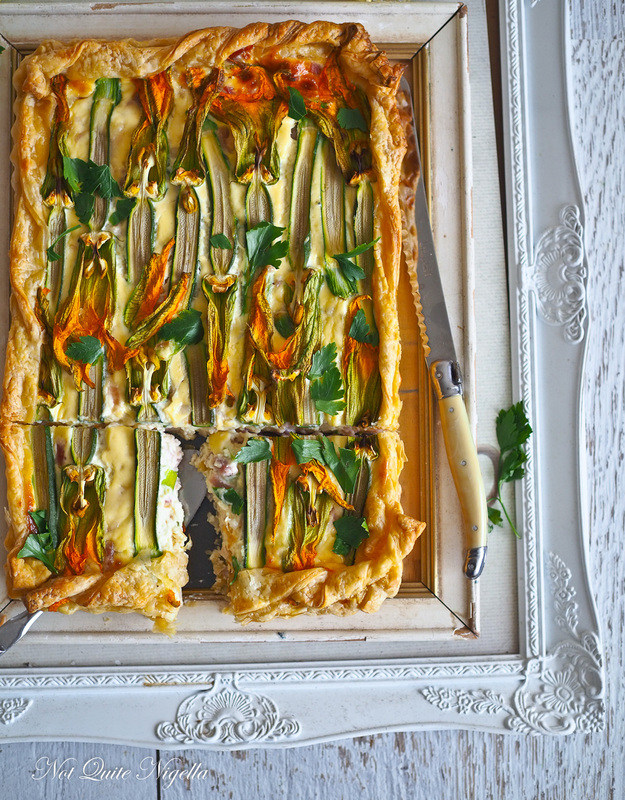 But it is such a delectable tart, making use of zucchini flowers that grow abundantly in summer and a few ingredients. And my Dear, Darling Reader, this is a definite pushy recipe. 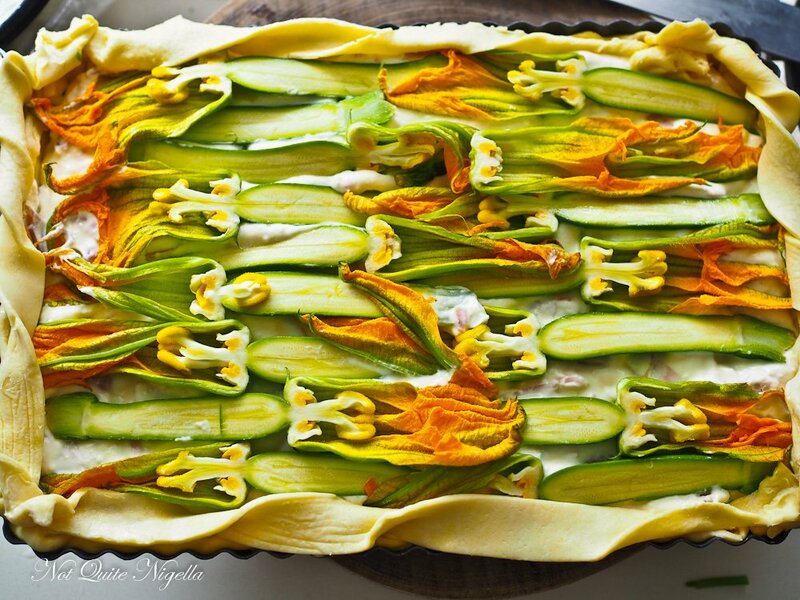 This is a very loose interpretation of an Italian ricotta tart with zucchini flowers or ricetta crostata salata alla ricotta e fiori di zucca. It was based on what I had at the time. Normally this tart is made with pate brisee but I love buttery puff a bit more and I think it really lends itself to that. The ricotta and eggs do a fabulous job of imitating a full fat cream quiche filling but with a much lighter touch. As for the bacon, I can't make any excuses for the unashamed enormous amount of bacon in this. Let's call this balancing things out. It is heaven sent in taste but also convenience. It is ridiculously easy with very few ingredients but nobody would ever know that when eating it. This tart was made for our friends Louise and Viggo who recently had a baby. We went to visit them in hospital a couple of days after their baby boy was born and I asked around about what I should bring. I was told that they would already have plenty of clothes but to bring something that could be frozen or ready meals. I tossed up between making a big batch of my traditional Bolognese sauce but that meant they had to make pasta and I have no idea how things work when you've got a newborn (the movies suggest that it is panic stations). So I made this which is a meal in one. Of course I snuck a piece of it and wished that I had made two, one for them and one for us! So tell me Dear Reader, what do you suggest as a gift for new, first time parents? Do you look for recipes with few ingredients? What number of ingredients is ideal for you or how many are too many? Step 1 - Preheat oven to 200C/400F. 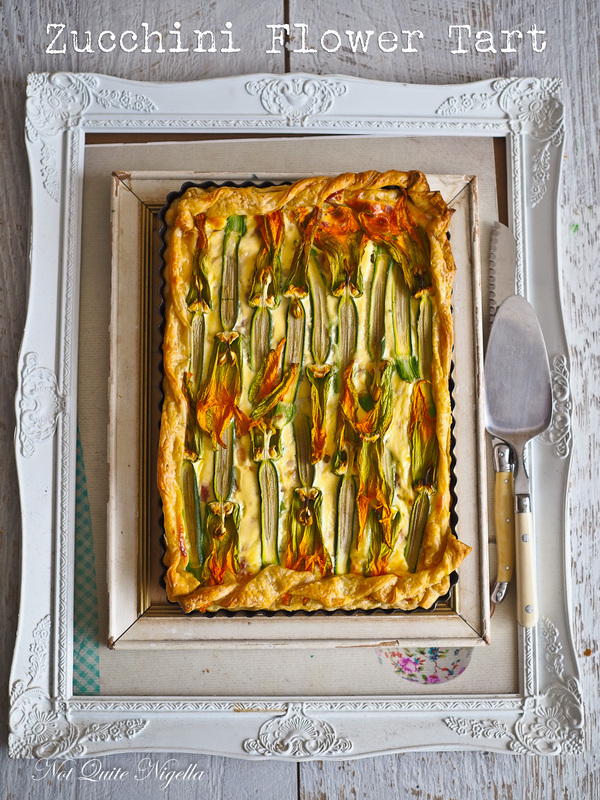 Line a 20x30cm tray with 1.5 sheets of the puff pastry, dock the bottom with a fork and bake for 10 minutes. Step 2 - While it is baking, finely chop the bacon (or place it in a food processor). Then in a food processor, blend the ricotta with the eggs and mix together with the bacon and green onions in a bowl. 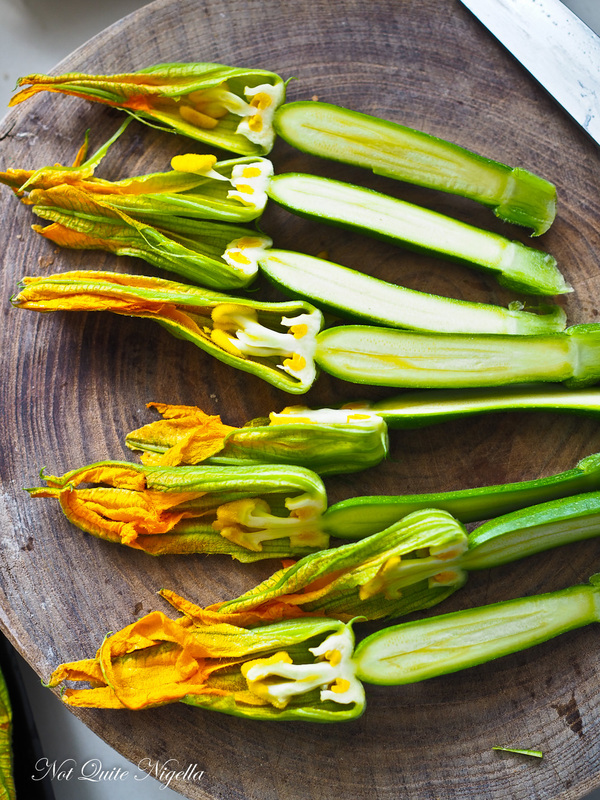 When the pastry is cooked, spread the ricotta mixture across the base and top with the zucchini flowers. Cut the remaining half sheet of pastry into four strips and twirl them and place them around the edge. Bake for 30 minutes. Allow to rest for 30-60 minutes so that the filling sets and becomes easier to cut. featureQuiche Not Lorraine & a Menulog offer! recipeThe 5 Minute Quiche in A Mug! feature Quiche Not Lorraine & a Menulog offer! recipe The 5 Minute Quiche in A Mug!